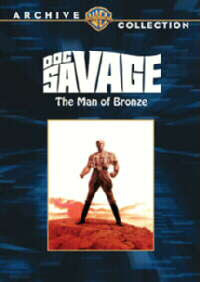 Doc Savage: The Man of Bronze is coming to your living room... and he's bringing a few thousand of his friends with him. The 1975 action film based on the classic pulp hero is just one of many movies that Warner Brothers is making available via a first-of-its-kind "on-demand DVD" service that's launching today. By visiting warnerarchive.com you can select from many films that have previously not been made available in the DVD format. You pay twenty bucks and a week later a custom-made DVD - complete with nice case - comes in the mail. I just scanned through the catalog (only a fraction thus far of the complete library that Warners aims to make eventually available) and there are some real gems in there, including Abe Lincoln in Illinois and Countdown, the 1968 pre-Apollo 11 flick starting James Caan as an astronaut caught up in a mad race between the United States and the Soviet Union about which country will be the first to land on the Moon. There's even 1982's Yes, Giorgio starring Luciano Pavarotti (wait a sec... Pavarotti made movies too?!?). This is one site that I am going to be watching with great interest. I think this is a very cool business model that Warners is experimenting with, and hopefully it will succeed enough for other studios to consider doing likewise. Categories: business, DVD, movies, warner bros.